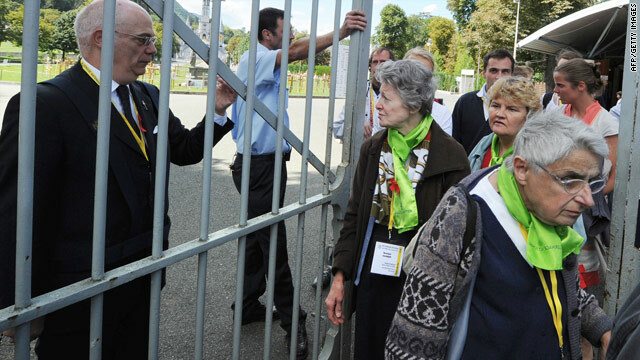 Pilgrims are evacuated from Lourdes, France, after a bomb scare during the Assumption festivities on Sunday. (CNN) -- Tens of thousands of Roman Catholic worshippers were evacuated from Lourdes in southwest France after a bomb threat, officials with the Notre Dame de Lourdes confirmed Sunday. The shrine reopened Sunday evening after 30,000 people calmly evacuated the site, according to Benjamin Foussier, as spokesman for the shrine at Lourdes. A bomb squad searched the area, but Foussier was not able to comment on whether it found anything. Police didn't immediately confirm the credibility of the threat.